I am back in Lichfield today for a visit to Dr Milley’s Hospital, organised by the local historian Kate Gomez and the local history group Lichfield Discovered. Dr Milley’s Hospital stands on the west side of Beacon Street, close to the entrance to the Cathedral Close. It dates back to 1424, but was rebuilt by Canon Thomas Milley in 1504, hence its name. Despite its name, it does not provide medical care but is a traditional “almshouse” that is home to ten women and on 24 June each year the annual “rent” of ten red roses is paid to the Bishop of Lichfield. Dr Milley’s Hospital was founded on property in the town ditch given in 1424 for the use of the poor by Bishop William Heyworth. The bishop’s gift, made on the feast of Saint Katherine (25 November), was confirmed by the dean and chapter in the following year. Local lore says the bishop gave the land on condition that one red rose for each resident was given to the Bishop of Lichfield – if demanded – each year on the Feast of Saint John the Baptist, 24 June. The custom was revived in 1987, and the Bishop of Lichfield is invited on that day to receive 10 red roses … the present bishop, Bishop Jonathan Gledhill, is due to retire in September 2015. The original grant by Bishop Heyworth makes no mention of the foundation of a hospital. However, two circumstances suggest the hospital dates for his benefaction and that it was founded about 1424. First, Bishop Heyworth gave the property to the sacrist of Lichfield Cathedral and the Master of the Guild of Saint Mary and Saint John the Baptist. Until 1940, the sacrist has always had a role in Dr Milley’s Hospital. The Guild acted as the city government in Lichfield for almost 200 years. Four generations of the Comberford family were members of the guild: in 1476, John Comberford was admitted to membership; in 1495, his son Thomas Comberford was admitted a member; in 1530, Humphrey Comberford was the Master of the Guild; and in that year his sister-in-law, as Dame Isabella Cumberforde, wife of Judge Richard Comberford, was admitted a member in her own right. Secondly, the site on which the hospital stands – a long narrow piece of land running back from Beacon Street and curving south to the Leamonsley Brook – is almost certainly the land given by Bishop Heyworth in 1424. The ground seems once to have been a ditch that formed the defences of Lichfield between the north-west corner of the fortified Cathedral Close and the bishop’s fishponds. The hospital’s endowment was increased by many other grants in the 15th century. Some time before 1438, a house in Beacon Street and a croft in Sandford Street were given to Hugh Lache who, as sacrist, was partly responsible for running the hospital. Lache seems to have been given the property while he was still sacrist. But he must have resigned that office by 1438, when he became subchanter. Later he became the Master of Saint John’s Hospital, Lichfield. The hospital’s income from rents was boosted when Thomas Heywood, Dean of Lichfield (1457-1492), gave a pasture in King’s Bromley; Canon Thomas Reynold (1471-1497) gave a house in Wade Street; and some time before 1504 the hospital acquired land in Lichfield called Godscroft from Thomas Atwell. By 1504, the cathedral chantry chaplains were making an annual payment to the hospital from the revenues of bequests in memory of Canon John Meneley, Prebendary of Offley, who died in 1480. However, the hospital was poorly endowed. In 1504, the annual income from bequests and legacies amounted to only £2.1s.10d. But four of the chantries in Lichfield Cathedral provided money for the poor, and in at least one case the money was specifically assigned to the poor in almshouses. Perhaps the sacrist and the leading members in the Guild provided charitable funds to help finance the hospital. The hospital was re-endowed and probably rebuilt in 1502-1504 by the Revd Thomas Milley, a residentiary canon of the cathedral. In 1502, he gave to 12 people, including three other canons and the sacrist, houses and land in Lichfield and lands at Borrowcop, Pipehill (both in Saint Michael’s Parish), Elmhurst (in Saint Chad’s Parish), Birchills (in Walsall), and Chorley (in Farewell). The sacrist was to use the rents from these properties to support 15 almswomen, who were to live in the hospital and receive five or six shillings a quarter in money and household necessities. The sacrist was also to keep the hospital in a good state of repair. He was to receive 13s.4d. a year to carry out these duties and was to answer to the Dean of Lichfield. The hospital continued to be run this way until modern times, and the sacrist was known as the Master or Steward of the hospital. The landed endowment remained substantially the same for three centuries after the hospital was refounded by Thomas Milley. The income of the resident women increased in the late 16th and early 17th century, with legacies from John Feckenham, George Saturford and others. The original hospital is said to have survived in the English Civil War in the mid-17th century, when the Cathedral Close was besieged on three occasions and the cathedral suffered severe damage. But dendrochronology shows that beams in the upstairs corridor in the present building date back to 1652, raising questions about the dating of different parts of the hospital. In 1809, the trustees found that some of the hospital lands had been lost and that the rents on other properties rents were in considerable arrears. Other property was held by tenants with long leases and nominal rents. In the early 19th century, the sacrist’s duties as chaplain included reading prayers in the chapel, administering the sacrament, and preaching once a year. In 1845, the sacrist, the Revd HI Cotton, agreed to hold a weekday service and to celebrate Holy Communion on three Sundays in the year. However, these arrangements were not continued by his successor. In 1893, a new scheme of governance was approved by the Charity Commissioners and provided for 15 resident almswomen. In 1902, their number was reduced to nine, and this was reduced to eight when the building was restored and reduced in size in 1906-1907. The hospital management and the appointment of the almswomen are now vested in the nine trustees. They normally include the Dean of Lichfield, although this is not the case at present. The only land now owned are the ground behind the hospital and at Chesterfield, near Shenstone. Eight almswomen live in the hospital. The office of sacrist was held ex officio by the Treasurer’s Vicar. Both offices lapsed after 1940, and the sacrist’s office has never been revived. From 1940 to 1948, Canon HL Muriel, Prebendary of Weeford, acted as chaplain, and since 1948 the chaplain has usually been one of the two priest vicars in the cathedral. Five years ago, the Revd James Potts, formerly Rural Dean of Stafford, was appointed Chaplain of Dr Milley’s Hospital. But who was Thomas Milley, and was he ever a doctor? Milley was Archdeacon of Coventry and Prebendary of Handscare and of Dasset Parva in Lichfield Cathedral. But there is no mention of his birthplace in the Lichfield records, and even his family remains obscure. He was one of the university men promoted by John Hales, Bishop of Lichfield (1459-1490). But it appears Milley was never a Doctor of Divinity (DD), and there is no entry for him in either the Cambridge or Oxford biographical registers. He is usually called magister in contemporary records, which indicates he was a master or university graduate. A “Master Thomas Mylly” who was ordained in Hereford Cathedral in 1446 could be the same man. He had held a prebend in the cathedral from 1457 until his death in 1505. He was Archdeacon of Coventry from 1488 to 1505 and around 1461 he built No 24 in the Cathedral Close. The house was in a ruinous state in 1461 when it was assigned to Canon Thomas Milley, who was Prebendary of Hansacre from 1457 and later Archdeacon of Coventry from 1488 to 1505 and regularly in attendance at Chapter meetings. He built or rebuilt the house in brick over stone vaults incorporating the base of a stone tower that abutted the cathedral ditch. No 24 was remodelled in the late 17th century, in the 18th century and again in 1812. This hospital for fifteen women was founded by Thos. Milley DD Canon Residentiary of the Cath: Church of Lichfield A.D. 1504. Indeed, it is not clear that Milley ever intended to give his name to the hospital. 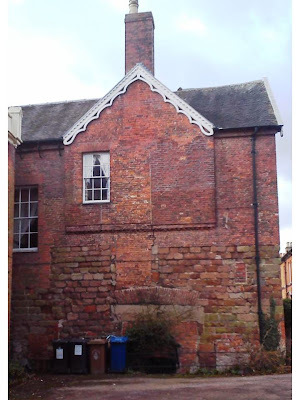 In 1687, the Archdeacon of Stafford referred to it as Saint Katherine’s Hospital in Lichfield. But until the 19th century, the hospital seems to have been known simply as the Women’s Hospital, and Lomax refers to it only as the Women’s Hospital in his History in 1819. So, Dr Milley’s Hospital is not a medical hospital, nor was it founded by a doctor, and it was not known as Dr Milley’s Hospital until perhaps the 19th century. But I am still looking forward to my visit this morning.